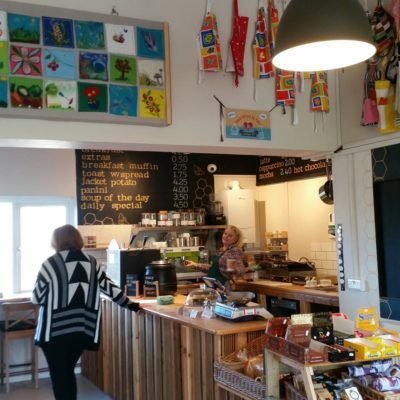 Roisin Tobin, business manager at community-run café and shop Buzz Lockleaze in Bristol shares with us some top tips on setting up and running a successfull community café. Buzz Lockleaze in Bristol is embedded in the local community. It delivers positive social benefit in areas such as social isolation and food culture. We also aim to support the local economy by delivering employment and enterprise support. Our shop window is a community café where we serve a range of delicious food and drinks sourced from local suppliers. The café is a key source of income for Buzz Lockleaze and helps us to deliver the positive social impact in our community. Allow yourself enough lead-in time to ensure that the necessary engagement is delivered within the community. Consulting with your community about exactly what they want to see from a particular community asset or social space is crucially important. The success of any community business requires garnering that community buy-in from inception. Secondly, be flexible and evolve with the needs of your community. At Buzz Lockleaze, we deliver a lot of wellbeing activities from our café, many of which started with one idea in mind. Our weekly games club, for example, was designed as a space for families to come together to play games and socialise. But, once we started the activity, it became apparent that the residents who were coming along were mostly residents with learning difficulties from the local supported living accommodation. We had to develop our services to match local demand. It’s now one of our most successful clubs! Lastly, take your time to reflect on your strategy and initial business plan. When we first set up the café, we were hoping to provide an accessible supply line to affordable, healthy, nutritious food for local people. To do so, we offered food in both our shop and café at a very low mark-up. But, we also operate in a very low income neighbourhood, so it proved difficult to generate a sustainable business model from that. We had to spend a lot of time reflecting on other financial models that more suit the neighbourhood in which we are based. You can hear more about community cafés in the latest episode of the Community Business Fix Podcast. Alternatively, find out more on what it takes to run a successful community café in our Community Business Success Guide to Cafés.